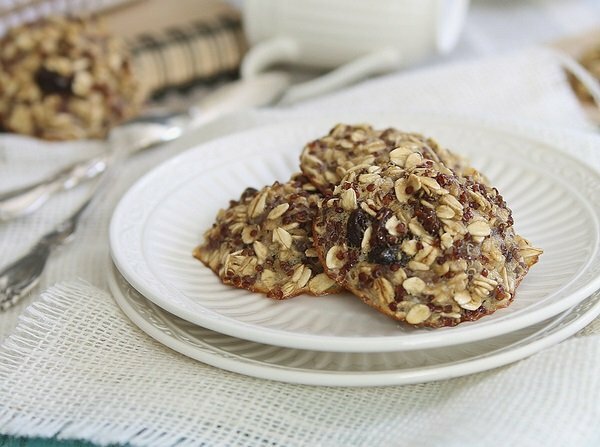 I’m always on the hunt for healthy breakfast recipes, and here are 5 that are extremely tasty and quick and easy to make. 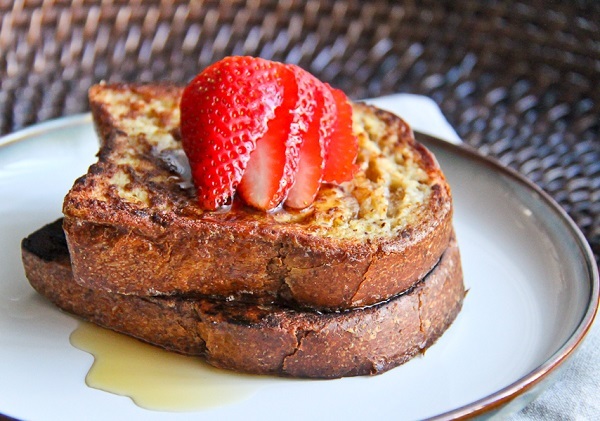 In this article, I want to share with you 5 healthy breakfast recipes that not only satisfy your sweet tooth, but provide you with plenty of protein and micronutrients as well. 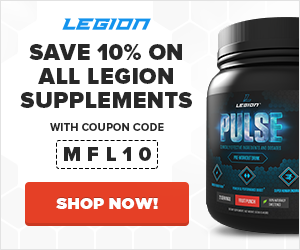 This is a delicious, super-filling breakfast to enjoy before a day of heavy training. The worst part about brunch dishes is the generous pour of maple syrup, but there are healthy replacements that are just as satisfying. Instead, top with all-natural peanut butter and banana slices. Or, mix a teaspoon of maple syrup and a drop of vanilla extract into 1/4 cup plain nonfat Greek yogurt, and serve with fresh berries. 1. Beat together the whole egg and egg white in a medium-sized bowl. Mix in protein powder and cinnamon. 2. Spray a large frying pan with coconut oil, and wipe excess with a paper towel. Heat over medium-high. 3. Dip a slice of bread in the egg mixture, and flip it over so both sides can soak it up. Lay it in the frying pan. Repeat with the second slice, and pour any remaining mixture over top. Sprinkle with chia seeds. Flip after about 2 minutes, once the egg has cooked enough to set. Continue cooking for one minute, until golden brown. What better than cookies for breakfast, the diet all little kids dream of? Feel like you’re being bad while being good with these cookies. They have all the makings of a balanced breakfast, and they’re super easy to whip up. If you have 20 minutes to spare in the morning, you can enjoy these fresh from the oven. 2. In a large bowl, beat the egg with a fork. Add the banana and vanilla extract, and mash all together. 3. Add the oats, quinoa, raisins, and salt, stirring with a hefty spoon until well combined. 4. Drop batter onto a greased cookie sheet, diving it into 8 or 10 cookies. 5. Bake for 12 to 15 minutes, until just browning around the edges. This breakfast will have you thinking you’re at a gourmet brunch so it’s a recipe to remember for holiday weekends. Although a spin on latkes and lox, this dish is far from traditional. It incorporates baked sweet potatoes for more nutritional value and fresh tarragon to bring the basic ingredients to a whole new level. 1. To make the tarragon-yogurt sauce, finely chop fresh tarragon. In a small bowl, mix together 1/3 cup yogurt, 2 tsp. tarragon, maple syrup, zest and a splash of fresh lemon juice. Store in the fridge, preferably overnight, to allow the yogurt to soak up the flavors. 2. Bake the sweet potato in the microwave for five minutes, puncturing the skin with a fork several times and wrapping it in a paper towel. Run it under cool water, and remove the skin with a knife. 3. Blend the baked sweet potato until smooth, and transfer to a large bowl. Add oat flour, egg, egg whites, vanilla extract, and remaining yogurt. 4. Spray a pan with olive or coconut oil, and wipe away the excess with a paper towel. Keep that on hand to regrease the pan after cooking the first pancake. 5. Spoon half the batter into the pan, and cook for a couple minutes, until it starts to set. Flip the pancake and cook for another 30 seconds to a minute. 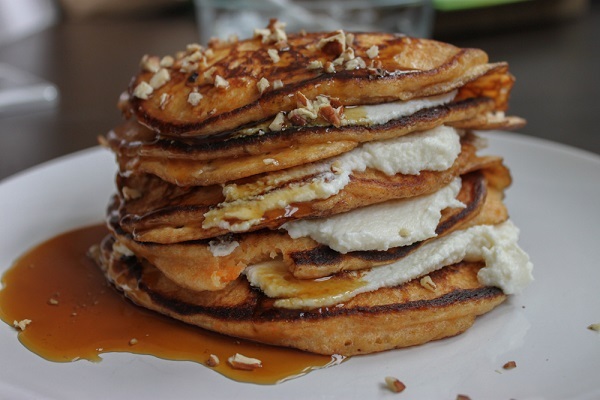 These pancakes will be beautifully golden brown because of the sweet potatoes. Repeat to make the second pancake. 6. Top each pancake with half of the lox and a generous dollop of tarragon-yogurt sauce. A nutritious breakfast doesn’t need to take a lot of time. Give your favorite breakfast cereal new life by preparing a parfait in minutes. A Greek yogurt parfait is a highly versatile breakfast since you can swap out whatever fruits and cereals you prefer, and it’ll make a great snack or sweet evening treat too. 1. Mix the protein powder and honey into the Greek yogurt. 2. 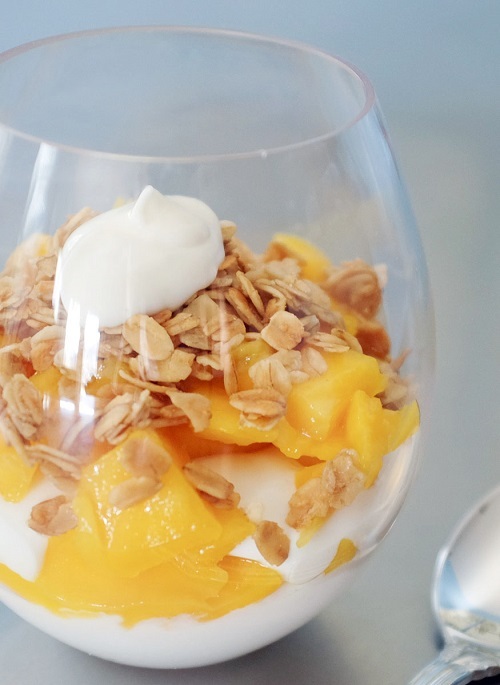 Starting with the granola, followed by the yogurt and the mango pieces, layer all ingredients together in a tall glass or dish. There’s nothing easier to eat on the go than a portable pastry, and you can make a batch on your day off and freeze them to enjoy later. Pop them in the toaster oven while you wait for your coffee to brew, or pull one out to defrost overnight. 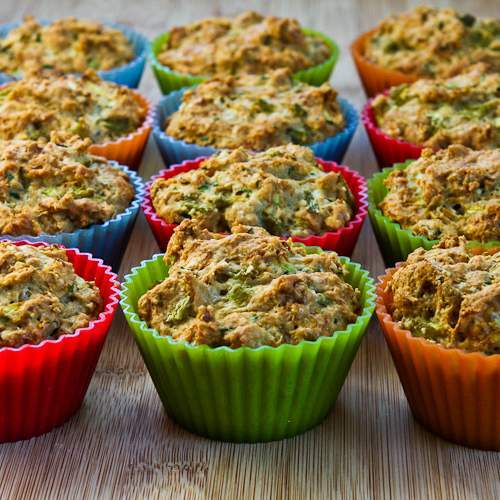 This recipe is well-balanced with zucchini, eggs, coconut, and stevia – but don’t forget to try out these high-protein muffin recipes too for breakfast variety. 1. Preheat the oven to 350°F. Line or grease 8 cups of a standard muffin pan. 2. In a large bowl, mix coconut flour, protein powder, and eggs until smooth. 3. Add all remaining ingredients, and stir until just combined. 4. Divide batter among the prepared muffin cups, and bake for 20 to 25 minutes. The muffins will be raised and slightly browning. What did you think of these healthy breakfast recipes? Have anything else to share? Let me know in the comments below!